Ravi Zacharias (born 1946) is a Christian apologist and teacher. 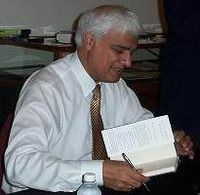 He is the president of Ravi Zacharias International Ministries (RZIM), which is headquartered in Norcross, Georgia. He also hosts the weekly radio program "Let My People Think" heard on over 1500 stations worldwide. Chuck Colson described Ravi as "the great apologist of our time". Zacharias was raised in a nominally Christian family in India that attended a "liberal-minded church", where Zacharias stated that he "d[id]n't ever recall hearing the gospel preached". He did not accept Jesus Christ as his Lord and Savior until the gospel was presented to him after a failed suicide attempt in his late teenage years. He eventually transformed this second chance at life into a love for God and for the practice of apologetics. Zacharias became the first non-Mormon to address The Church of Jesus Christ of Latter-day Saints (LDS Church) at its signature pulpit in the Salt Lake Tabernacle. The sermon was on "Who Is the Truth? Defending Jesus Christ as The Way, The Truth and The Life". Ravi Zacharias International Ministries is a Bible based ministry with the main focus towards worldwide evangelism undergirded by apologetics, reaching the thinker and opinion makers of the world. With a commitment to strengthening the church, the organization trains emerging leaders through its programs and leadership development curricula. RZIM recognizes that historically the benefits and ethics of any culture are powerfully influenced and molded by the intellectuals and entertainers of society. Moral values do not only enter through the door of reason, but also through the window of the arts and media. With this in mind, this ministry is geared to communicating the Gospel to people on their territory, and presenting the credibility of Christianity as the only reasonable option by which people should live. RZIM was formed in 1984 in Toronto, Canada, and currently headquartered in Atlanta, Georgia.